The upcoming Battlefield 3 won't be a PC exclusive but EA DICE says the effort it's putting into that version of the game will be "extraordinary" even by its own standards. Digital Illusions Creative Entertainment, better known as EA DICE, tends to draw a lot of water with PC shooter fans thanks to its high-visibility commitment to the mouse and keyboard. What that actually adds up to for PC gamers is a bit tricky to nail down but it sure looks good on paper and DICE hasn't been above leveraging its love for the platform to zing other studios and even fan the flames of the console wars a bit. Which isn't to suggest it's ready to ditch the consoles just yet, but the studio did put out a little reminder today about where its heart really lies. "[Battlefield 3] will not be exclusive," DICE Lead Designer David Goldfarb wrote on Twitter. "We are putting special effort into the pc version, even for us, it's extraordinary"
There's no clue as to what the "special effort" is and it may not turn out to be much at all. Some PC gamers are so desperate for relevance that just telling them they're still important and loved is sometimes all it takes to keep them warm and happy for months. Then again, with console exclusivity facing them at every turn, it's not too surprising that they'll take what they can get. And who knows? Maybe DICE does have something big up its sleeve. We'll let you know if we hear anything. 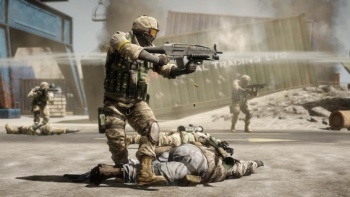 Battlefield 3 is currently slated for launch in the second half of 2011 for the Xbox 360, PlayStation 3 and PC.